A long short story and worth the money in quality of the old Hemingway of Men Without Women days -- though in quantity it can't bulk to more than a scant 150 pages. A unique fishing story -- as old man Santiago determines to try his luck in the Gulf waters off Cuba for the eighty fifth day. Surely his luck will change, he assures his faithful young friend whose parents wouldn't let him fish any more in such an ill-fated boat. So the boy goes along in imagination with the old man, pretending that there is enough food in the shanty- and supplementing the lacks from his own table; pretending that bait could be found- and bringing him sardines; planning for getting some warmer clothes for him and lugging water from the village pump; talking gaily of the great "DiMag" and of the game the Yankees are sure to win. And then the old man goes out -- beyond the other fishing boats -- and drops his lines in the way he has always done, and baits the hooks so that his hoped for great fish could smell and taste. The miracle happens -- and the fish, a giant marlin, is bigger than any fish dreamed of. And the old man is alone....The story of that battle, that carried him out to sea and lasted through two days and two nights, is one of the miniature modern classics of such writing. And the story of the sailing back to port, as little by little the scavengers of the sea stripped what was to have been his livelihood for months to come, down to the skeleton, is grim and heartbreaking. A miracle tale, told with such passionate belief that the reader, too, believes. 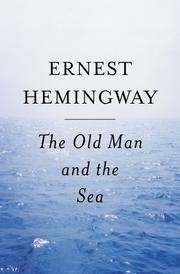 There's adventure here and Hemingway's old gift for merging drama and tenderness gives it a rare charm.